​In order to tell Nicholas Brody’s story and catch up “Homeland” fans for Season 3, Showtime presented the events of Season 2 through a news retrospective in Homeland Aftermath. 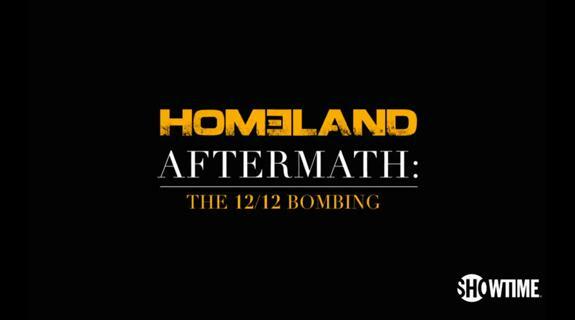 Homeland Aftermath is a multimedia presentation of the events from “Homeland’s” Season 2 finale. 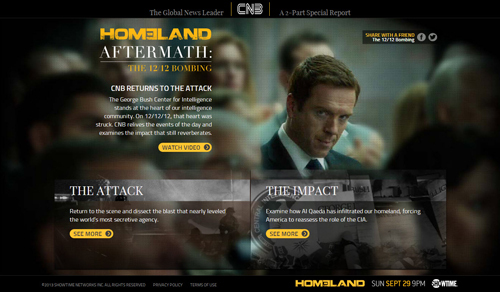 Presented through the eyes of the show’s fictional media organization CNB, the site itself resembles a news channel’s look back on a historic event, in this case the bombing at the end of “Homeland’s” second season. The multimedia site, including a look back at the events of the finale, was developed with the show’s writers as an interactive space for fans as well as continuing the series narrative into Season 3. 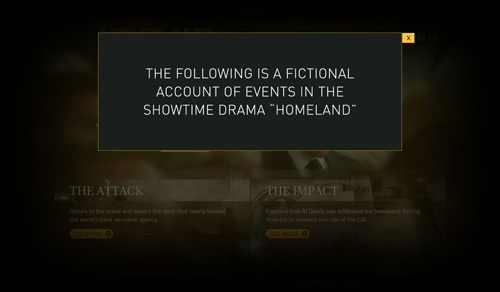 12/12/12, the date of the bombing within the show, becomes a branding technique throughout the site and is used throughout an interactive timeline of events, fictional news reports and graphics depicting details of the attack. A mini documentary was also released as part of the effort (above), which describes what happened at the end of “Homelands” Season 2.